Shockingly, suddenly, tragically, the actor was found dead at his home in Tiburon, Calif., this morning, according to the Marin County Sheriff's Office Coroner Division. "Robin Williams passed away this morning," his rep confirmed to E! News. "He has been battling severe depression of late. This is a tragic and sudden loss. The family respectfully asks for their privacy as they grieve during this very difficult time." Williams had been extremely candid--and humorously self-deprecating--when it came to his past battles with substance abuse. Earlier this summer he had checked into a preventive treatment facility as part of what his rep called his "continued commitment" to staying sober. According to the Marin County authorities, a 911 call was received at 11:55 a.m. reporting that a male adult had been found unconscious and was not breathing. The Sheriff's Office and Tiburon Fire Department and Southern Marin Fire Protection District were dispatched to the scene and arrived at noon. Williams was pronounced dead at 12:02 p.m.
An investigation is underway into the cause, manner and circumstances of his passing, but the Coroner Division suspects the death may have been suicide due to asphyxia. An autopsy will be performed Tuesday. The Sheriff's Office said that Williams' wife last saw him alive at home at 10 p.m. on Sunday. "I am completely and totally devastated. What more can be said?!" Pam Dawber, the Mindy to his Mork, said in a statement. The multifaceted actor, whose breakout role came playing rainbow-stripe-favoring alien Mork from Ork on TV's Mork and Mindy (a spin-off after he originated the role on Happy Days), starred in some of the most beloved films—both comedies and dramas—of the past 35 years. His first major role on the big screen came as the spinach-swillin' titular sailor in Robert Altman's Popeye. Williams' movies have made over $5 billion worldwide, the most successful of them being 1993's Mrs. Doubtfire, which made more than $429 million in the U.S. A sequel was in the works at the time of his death. While his name tends to be synonymous with comedy, and he's also considered one of the all-time great standups, Williams' dramatic work earned him great critical acclaim as well. He won the Academy Award for Best Supporting Actor for his role as a compassionate, brilliant and still-grieving psychologist opposite Matt Damon's troubled genius in Good Will Hunting and was nominated for Best Lead Actor three times beforehand, for Good Morning, Vietnam; Dead Poets Society, and The Fisher King. "Robin Williams was an airman, a doctor, a genie, a nanny, a president, a professor, a bangarang Peter Pan, and everything in between," President Barack Obama said in a statement. "But he was one of a kind. He arrived in our lives as an alien—but he ended up touching every element of the human spirit. He made us laugh. He made us cry. "He gave his immeasurable talent freely and generously to those who needed it most—from our troops stationed abroad to the marginalized on our own streets. The Obama family offers our condolences to Robin's family, his friends, and everyone who found their voice and their verse thanks to Robin Williams." "I saw him onstage the very first time he auditioned at the Improv in Los Angeles, and we have been friends ever since," recalled Jay Leno. "It's a very sad day." The list of films in which he stole every scene he was in is basically his IMDb page, but to just name a few here: Aladdin (as the voice of the inimitable Genie), The Birdcage, Awakenings, Hook, Cadillac Man, Jumanji, Night at the Museum and, literally, so many more. "Robin was a lightning storm of comic genius and our laughter was the thunder that sustained him," Steven Spielberg, who directed Williams in Hook and A.I., said in a statement. "He was a pal and I can't believe he's gone." Williams even failed big, with Death to Smoochy remaining one of the most talked-about, infamously bad movies that an A-list ensemble has done in recent memory (also thanks in part to periodic reminders on The Daily Show from Jon Stewart, who enjoys poking fun at his acting days). Toys, Jack, Patch Adams, Bicentennial Man and What Dreams May Come were pretty forgettable, too, and yet...not, thanks to Williams. Williams wasn't afraid to take a turn for the creepy, either, parleying his usual likeability into unsettling turns in Insomnia, One Hour Photo and, on the small screen, Law & Order: Special Victims Unit. CBS' The Crazy Ones marked his much-heralded return to TV last year, Williams playing an eccentric ad exec who's in business with his no-nonsense daughter, played by Sarah Michelle Gellar. The sitcom was canceled after one season but was a big hit with those who just wanted to see SMG and Williams doing anything on TV. "Our world has lost a comic genius, a gifted actor and a beautiful man," CBS said in a statement. "We will remember Robin Williams as one of the unique talents of his time who was loved by many, but also as a kind, caring soul, who treated his colleagues and co-workers with great affection and respect. Our heartfelt thoughts and sympathies go out to his family, loved ones and friends." Over the years, in addition to his Oscar, he also won four Golden Globe Awards, two Emmys, two Screen Actors Guild Awards and five Grammys, four for Best Comedy Recording and one for Best Spoken Word Album for Live 2002. Williams was known for his philanthropic work, especially the Comic Relief specials he periodically helmed with Whoopi Goldberg and Billy Crystal. He was an active supporter of St. Jude Children's Research Hospital, the organization remembering him today as an "iconic man and entertainer." The man of 1,000 (or probably more) voices also took his talents overseas entertaining U.S. troops stationed abroad. "The entire USO family is saddened by the news of Robin Williams' passing," the United Services Organization tells E! News. "One of the great comedic actors of his generation, Williams traveled around the world to lift the spirits of our troops and their families. He will always be a part of our USO family and will be sorely missed." Also reacting to Williams' passing, Joan Riverssaid, "Everyone remembers him as a brilliant comedian but he was much more than that. He was an extraordinary actor and very generous in spirit. I cannot remember a time that we were together that he didn't make me genuinely laugh. He was one of the nice guys. I wish I had been closer to tell him what I learned the hard way...that suicide is a permanent solution to a temporary unhappiness. I really, really liked him. It makes me very, very sad." His most recent film to hit theaters was the indie dramedy The Angriest Man in Brooklyn, in which he plays an insufferable patient who's told by a doctor, played by Mila Kunis, that he has only 90 minutes to live. In Boulevard, which premiered at the Tribeca Film Festival in April, Williams played a meek bank employee who's just going along until he meets a young man who shakes him out of his complacency. 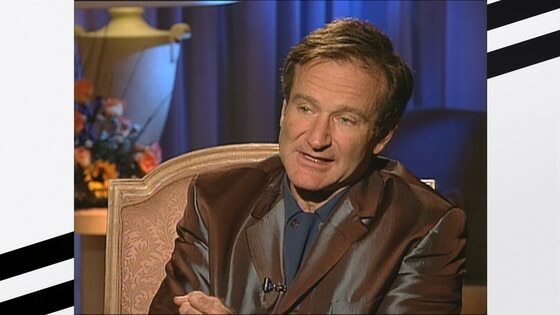 "No matter what Robin Williams wants to do, he is forced to be trapped," director Dito Montiel told Reuters at the time. "With Robin, his silence is deafening. I thought how fun would it be to see him when he can't do any of that stuff." The celebrated actor will return to the big screen Nov. 7 in Merry Friggin' Christmas (also available on VOD that day) and again—in much wider release—on Dec. 19, reprising his role as Teddy Roosevelt in the sequel Night at the Museum: Secret of the Tomb, two of several as-yet unseen projects that he left behind. "I am shattered by the loss of my friend and collaborator Robin Williams," Shawn Levy, who directed Williams in all three of the Night at the Museum films, told E! News. "Onscreen and off, this was a formidable, incredible guy—generous in the best way: with his heart and humor, devoted to making others happy. Over his remarkable career, Robin moved us to tears; sometimes from laughter, sometimes from humanity, sometimes both in the same moment, a feat that few performers have equaled. I will miss Robin deeply but I will never stop treasuring the phenomenal, enduring work he gave to us all. Robin Williams was that rarest of things: a true and forever one of a kind." Robin McLaurin Williams was born July 21, 1951, in Chicago to Robert Fitzgerald Williams, an executive at Ford, and Laura McLaurin, a former model. He grew up in Bloomfield, Mich., and pursued higher education at what is now Claremont McKenna College in California and the College of Marin, where he appeared onstage in both comedies like A Midsummer Night's Dream and tragedies like Macbeth. He was one of a reported 20 freshmen accepted to Juilliard in 1973 and only he and one other actor—Christopher Reeve—were accepted into the NYC school's advanced program that year. Williams married Susan Schneider, his third wife, in October 2011. In addition to her, survivors include son Zachary with first wife Valerie Velardi; and daughter Zelda, who's also an actress, and son Cody with second wife Marsha Garces Williams.